The Montmorency cherry is the favorite pie cherry of the semi-tart variety. Blue ribbons are given for these delicious morsels and we got a few at the county fair. Even though they are tart, birds love them and we must net the trees in early June. Picking time is normally July 4th. 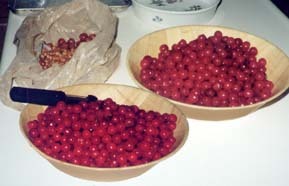 Forty-one pounds of pitted cherries from two trees was our record crop. 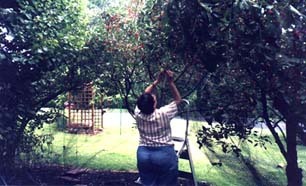 Normally we get about twenty-five to thirty pounds of pitted cherries each year. I try to prune the tops to keep the fruit reachable by ladder. 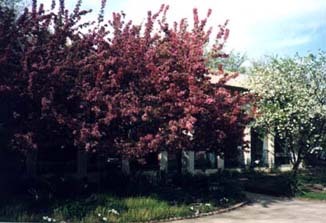 Cherries blooming in the spring (Light Pink blossoms, above). Then about July 4th, open the nets - for it's cherry picking time in blue Ash! First we tried a potato peeler to get the pits out. Although it worked, we later bought a "Stoner" for the job. Now I can pit that bowl in just a few minutes! 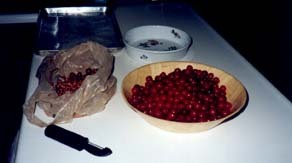 Once pitted we freeze the cherries in two pound (2-cups) zip tight plastic bags (Ah, the wonders of petroleum). When we want a pie or cobbler, two bags work fine. Sometimes, when we have a surplus (or the freezer is full), we sell them at apple harvest time from the garage.